TECHNI Waterjet™ Lenexa, Kansas, has announced Micro Waterjet LLC will be teaming up with TECHNI Waterjet’s pump line, the Quantum NXT Electric Servo Pump, on their ultra-high precision cutting micro waterjet. The companies are combining the two technologies to take advantage of high precision cutting and the latest in high pressure pump technology within the US market. Micro Waterjet will set up a demonstration machine in TECHNI’s Advanced Applications Lab at their US headquarters in Lenexa, Kansas. The new micro waterjet C4 will be housed within TECHNI Waterjet and will be complete with our Quantum NXT Electric Servo Pump. Micro Waterjet is able to achieve a cutting accuracy of +/- 0.01mm and a positioning accuracy of +/- 0.003mm with the C4 micro waterjet. “Micro Waterjet LLC is happy to have teamed up with Techni Waterjet, so that we can put together the most innovative pump technology, using Techni’s electro servo pump paired up with high precision cutting technology from Micro Waterjet,” said Managing Director, Steve Parette. “Techni’s ESP pump is a natural fit for the precision Micro Waterjet’s C4 and F4 machines offer. The Quantum NXT is the most innovative, efficient, quietest and intelligent pump on the market, so the technologies complement each other very well” said Techni Sales Manager, Jim Fields. 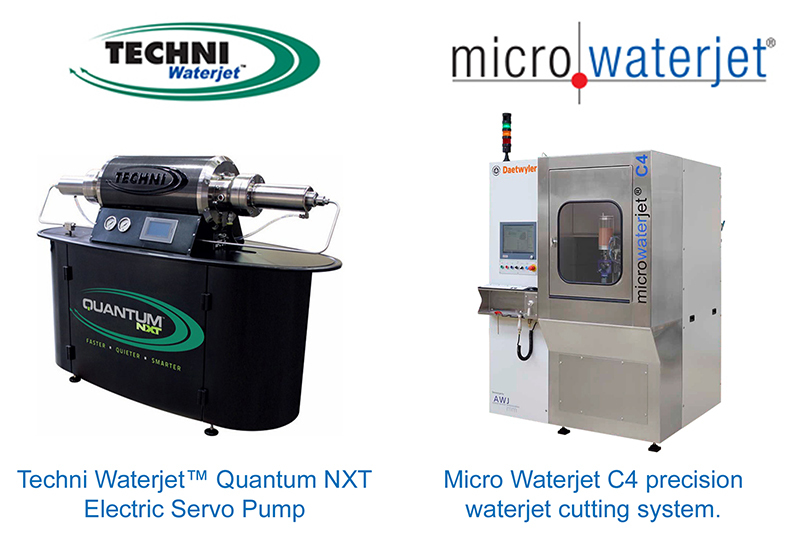 TECHNI is thrilled to partner with Micro Waterjet to join both waterjet cutting technologies for the most innovative micro waterjet cutting system in the United States. Fore more information on the TECHNI WaterjetTM Quantum NXT Electric Servo Pump, click HERE.